The days-long celebration in Rome was centered on a solemn ceremony inside St. Peter’s Basilica on Saturday morning, Nov. 19, during which Pope Francis elevated 17 men to the rank of cardinal. They will advise the pope, and 13 of them are eligible to vote for his successor. The service, called a consistory, was bookended by numerous celebrations and prayer services. In the days leading up to the event, four cardinals, including Cardinal Raymond Burke, of the United States, made their disagreements with the pope public—and even threatened a public rebuke if he ignored their questions. At issue, they said, are ambiguities in one of the pope’s pastoral letters, “Amoris Laetitia.” The letter is the pope’s summary of a two-year discussion of family issues held by bishops from around the world, including hot-button topics like divorce, homosexuality and a breakdown in societal support for families. Some bishops have said the document’s emphasis on conscience, reconciliation and discernment opens the door to Communion for divorced and remarried Catholics, a view the pope himself seemed to endorse. The four cardinals opposed to such an interpretation sent a letter to the Vatican in September asking for yes or no answers to five questions they had about the document. The pope chose not to respond, leading to threats of a public rebuke from Cardinal Burke. “But life is full of ambiguity,” Cardinal Cupich said at a press briefing at the Pontifical North American College following the consistory. 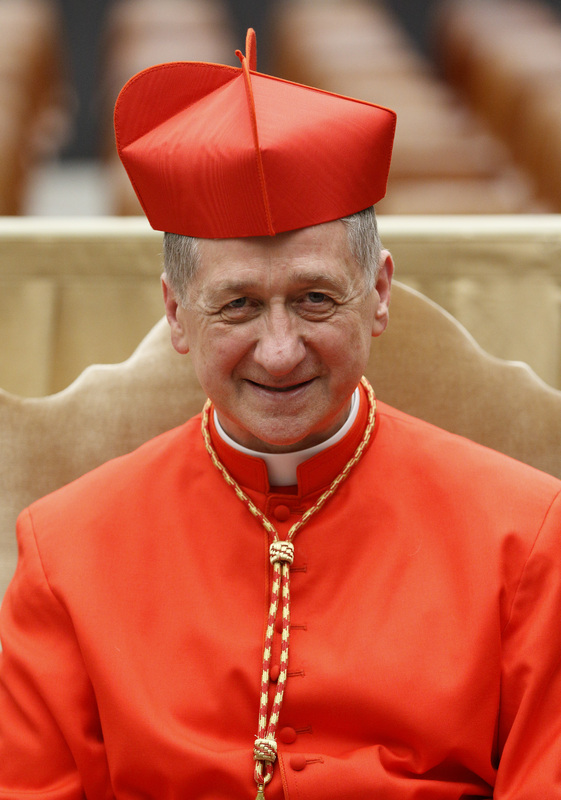 Cardinal Cupich, who was handpicked by Pope Francis to lead the church in Chicago, also downplayed the notion that there exists widespread opposition to the pope or that Francis should be forced to defend his teaching. This situation is beginning to sound to me like the haunting election process we just completed for the presidency. While I understand the perceived need for clarification, do cardinals typically set parameters with which a pope must comply? "Yes-no" answers are binary and much important information can easily be omitted with this format. I cannot speak theologically about cardinals' proper approach to their pope with, according to the article, a potential threat in the person of Burke, but psychologically this is a double-bind dynamic. If the pope responds, he may appear weak in the face of his confrontational confreres and if he does not, how can he know what to expect? There is a movement within our Church to keep the door closed while, at the same time, a Herculean attempt by our leader to pull it open. And from whence do these cardinals think new concepts and new insights come from? Not from the stodgy confines of chanceries and seminaries. The entire role of women in the church is up for grabs now and will certainly involve passionate claims and responses on many sides of the question. Perhaps the entire celibacy issue will finally surface and be dissected in its harm to priestly vocations. Are we all to go meekly and quietly into the night only to pray, pay and obey? This is a great article; simple, straight forward and honest. We do have a polarization within our Church, but there is much hope for us all if we do not fixate on the polarization but to move forward in our journey to Christ. First, we have been witnessing the polarization between the laity and the hierarchy over many moral teachings as demonstrated by the survey of worldwide Catholic opinion that was done for the 2014-2015 Synod on the Family. Ok, but this is an issue the Church has to adequately addressed. Hopefully, the Synod on the Young that Pope Francis has called for will help. Second, we have witnessed polarization between U.S. priests and many moral teachings. This is another dimension of the problem that the Church must address as well. Third, and most importantly, we are witnessing a polarization among the bishops, especially with respect to the interpretation of Amoris Laetitia (AL). This seems to be manifested in the question: whether Holy Communion for some divorced and remarried Catholics can be permitted based on AL's discernment process involving priestly council, circumstances, a repentant heart, proper conscience formation and judgment, mercy and the principle of graduation. Recently, Bishop McElroy of San Diego conducted the first, and only, diocesan Synod on the Family in light of AL. This Synod involved clergy, theologians and the laity. They concluded that Holy Communion can be permitted for divorced and remarried. Detail procedures on the results of this diocesan Synod, and the process of discernment, is expected to be issued within the next couple of months. Hopefully, more bishops will follow the path of Bishop McElroy. How to accompany the wounded with love and mercy, like the divorced and remarried in their journey to Christ, is what Amoris Laetitia is all about. R.R. Reno recently made this statement about Francis' teaching -"The “gospel” is mercy without judgment, grace without truth, and church without form." There are no harsh truths, just accompaniment, discernment, etc. Christ didn't preach this feel-good therapy. He told us the way to salvation is a difficult one. Mercy is always available, but it involves forsaking our sinful ways. He understands if we fall innumerable times,, but He requires an honest effort. We will have to agree to disagree on this subject. R. R. Reno is a theologian who does not agree with Pope Francis's Amoris Laetitia (AL), as do other theologians. Many Bishops such as Bishop Chaput of Philadelphia and Cardinal Burke also disagree with AL. On the other hand, many other bishops do agree with the vision and theology of Pope Francis, as well as many priests, theologians and the general laity. Nevertheless, this does not mean that the issues in AL do not require a more adequate and clearer explanation. This is always part of the tension of any teaching development especially when it touches both marriage doctrine and pastoral theology. For example, when usury was reformed in the 16th century, after numerous papal bulls and Councils claimed it as divine law, no one to date has been able to explain how a prohibition clearly written in Scripture could be reformed. Similarly, there was also no such thing as freedom of religion as this teaching was taught as truth for centuries, but that teaching was reformed as well. We will have to end it here as I believe our disagreement will only end in a protracted argument with neither of us convincing the other of our respective positions. Agreed. Not worth the aggrevation. The Primacy of Conscience is a teaching of the Catholic Church. Aquinas taught that even an erring conscience binds. John Henry Newman in his Letter to the Duke of Norfolk famously made clear the primary of conscience: "I shall drink - to the Pope, if you please - still, to Conscience first, and to the Pope afterward." Pope Benedict XVI also wrote that one must never go against their informed conscience even if it is in tension with a teaching of the Catholic Church. In moral theology there are two famous moral theologians that represent different schools of thought on conscience today. > Germain Grisez who essentially argues that if an individual's conscience is in tension with a teaching of the magisterium, it is not properly informed because a properly informed conscience would conformed with Catholic teachings. In other words and according to his school of thought, the only thing one has to know is the teaching of the Church; there is no room for a conscience that differs. This argument puts the authority of the magisterium over the authority of one's informed conscience. This argument is often called a 'theology of conforming'. > Bernard Herring argued, in short, that a properly informed conscience, regardless if it was in tension with a Catholic teaching or not, was binding. In other words, his moral philosophy was in accordance with the teachings of St. Thomas Aquinas. This school of thought is often called 'a theology of informing'. Besides the issue of 'authority', there is the issue of how to form one's conscience properly. In brief, Catholics must adequately educate themselves about the issue under consideration, seek priestly and moral theological counsel, ask questions until there are no more to be asked, pray frequently for enlightenment, keep an open mind as to current and future scholarship on the subject in question, and have an open mind to the pro and con moral theological arguments. Additionally, one should strive to be humble as best we can as popes and laity do not see the fullness of truth. In other words, while the truth never changes, our understanding of the moral truth does change as many moral teachings of the Church were taught for centuries as truth, but were eventually changed. Pope Francis is a proponent of a properly informed conscience called the 'internal forum" and has used this teaching and the discernment process (e.g., in Amoris Laetitia) between the priest and the individual to allow Holy Communion for the divorced and remarried under certain conditions. This discernment process essentially guides the priest and the individual to form a properly informed conscience and helps the person determine if God is calling him/her to the Eucharist especially when they are in irregular situations and complex moral circumstances. I hope this short explanation helps. Cupich, Tobin, Schonborn can throw as much shade as they like. I and many others will never accept Francis' teaching on divorce, etc. This is The Jesuits' time, and they will try to ram through as many "reforms" as they can. Might does not make right. Two thousand years of teaching can't be tossed by one man. The sister who taught my high school chemistry class once said “If you can’t teach it, you don’t know it.” The cardinals who presented the dubia to Pope Francis were asking for a defense of ambiguous statements in Amoris Laetitia. Cardinal Cupich tells them they need conversion. I, as a lay Catholic, am not in a position to defend what appears to be a new teaching or to judge anyone’s depth of conversion. However, I and others like me are often the first line of Church representative that friends and family question about Catholic teaching on divorce and remarriage. While the hierarchy is “looking inward for clarity”, the flock is left to form their own interpretation, leading to even greater confusion. Could our Pope and the already-converted bishops at least provide us with some guidelines and examples of the types of remarriage situations that will be considered for accompaniment to Communion? This article also appeared in print, under the headline "New U.S. Cardinals Condemn Polarization Inside the Church," in the December 5-12, 2016 issue.